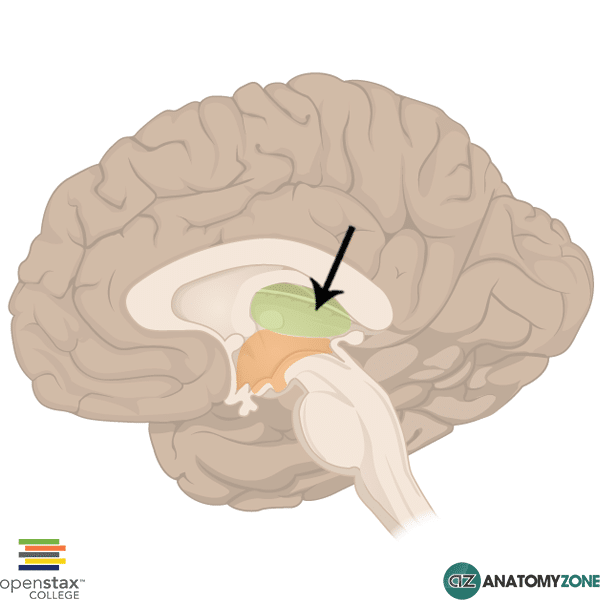 The structure indicated is the thalamus. The thalamus essentially acts as a sort of “relay” for the brain, consisting of several nuclei with reciprocal connections to and from the cerebral cortex. It also forms important connections with the hippocampus via the mammillo-thalamic tract, and connections with the spinal cord via the spinothalamic tract which transmits peripheral information regarding pain, temperature and crude touch. The thalamus is therefore important in several functions including, sleep, wakefulness and arousal, consciousness, and sensory/motor functioning. The internal medullary lamina itself contains several groups of nuclei, referred to as the intralaminar nuclei. Lateral to the lateral nuclear group is the external medullary lamina. Lateral to the external medullary lamina is the reticular nucleus. The nuclei of the thalamus are divided into specific and non-specific nuclei. The nuclei with projections to a specific area of the cerebral cortex are referred to as the specific thalamic nuclei, those nuclei without connections with the cerebral cortex are referred to as the non-specific nuclei (these have projections to the brainstem and other nuclei of the diencephalon). Generally speaking, the specific thalamic nuclei are found within the three main nuclear groups mentioned above (anterior, medial and lateral nuclear groups), whereas the non-specific nuclei are those found within the internal medullary lamina – the intralaminar nuclei. Learn more about the anatomy of the brain in this tutorial.